When it comes to weather, Cyprus can be divided into three distinctive areas: the coastal areas which include most of the touristic destinations of Cyprus, the inlands which is mainly Nicosia and the surrounding areas and the Troodos mountains range. Although the weather and climate of Cyprus applies for all Cyprus, there are differences between these three sections. For example, inlands (Nicosia area in the center of Cyprus) are the hottest during the summer with temperatures rising to 35 to 37 Celsius degrees regularly and even climb to 40 occasionally. During the same days, temperatures at the coastal areas would typically be between 29 to 31 degrees to the west (i.e. 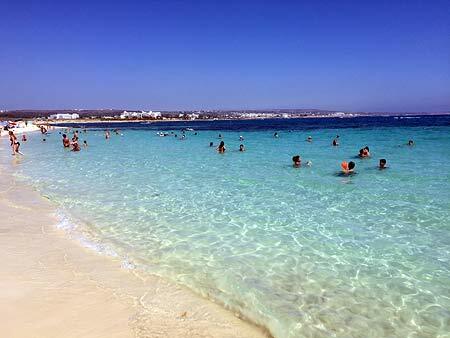 Paphos area) and 30 to 33 degrees for the south coast (Limassol, Larnaca, Agia Napa, Protaras, Paralimni). 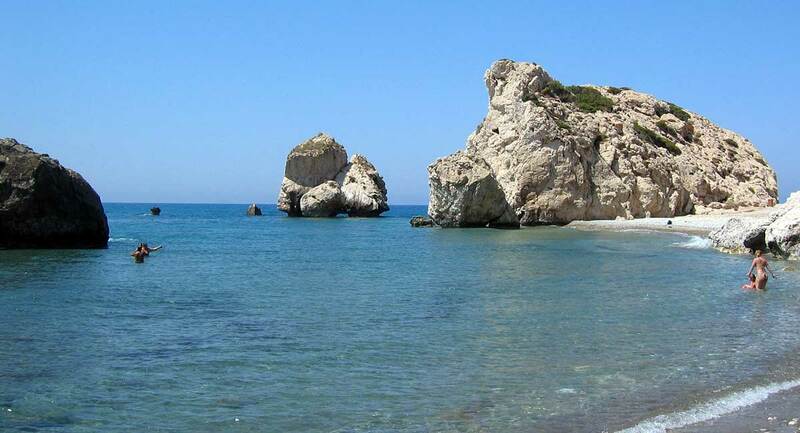 Cyprus has a long, hot and dry summer which lasts for about six months from mid April to mid October and a short, mild winter which lasts for about three months, from December to February. In between, we have short spring and autumn seasons of about one and a half month each. Typical summer average temperatures in Cyprus are between 28 and 33 Celsius degrees in coastal areas, 34 to 37 degrees in central area of Cyprus and 27 to 31 degrees on the mountains. There are hotter days than these average temperatures with maximum around 42 in Nicosia and 35 to 36 at the coast, whereas minimum day temperatures rarely drop below 28. Night average temperatures are between 20 and 22 degrees. Rain during the summer is extremely rare. Spring and autumn temperatures are warm, around 25 degrees on average but occasional days with temperatures below 20 or above 30 occur. Nights are cool or even chilly, with average temperatures between 12 and 15 degrees. Although, in general, the weather during spring and autumn can be safely considered as summer, there can be a few rainy or winter like days during the period. During winter months of December, January and February temperature drops considerably. Average temperatures are around 17 degrees in December and 15 to 16 degrees in January and February on the coastal area, more or less the same for Nicosia and central area of Cyprus and between just 6 and 8 degrees for the mountains. Winter months are the wetter months of the year, with around 8 to 10 rainy days per month on average for coastal and inland / central areas and around 15 to 18 days of rainy days for Troodos Mountains. Snow fall occurs on Troodos and the mountains in general, but some times snow may appear on lower altitudes, but never on coastal areas. Even during the winter months the average daily sunshine is about 5 hours. You should always bear in mind that average and actual conditions differ. This means that it is a possibility to visit Cyprus during, lets say, January, for 7 days and face seven consecutive rainy days if you are very unlucky, or seven bright, sunny, almost summer like days if you are very lucky. But usually bad days do not last more than 2 to 3 days, or you may experience both rain and sunshine on the same day, which is very usual for the winter period. Sunshine is present all year round in Cyprus, even in the winter. On average one should expect between five and seven hours of sunshine per day during the winter and up to eleven to twelve hours of sunshine during summer. Especially during summer, sunshine is continuous and bright, even small clouds are rarely seen during summer months. Winds’ general direction is from west, but very strong winds are rare. Humidity is between 60% and 80% in winter and 40% and 60% or even higher in summer. For summer humidity is a problem sometimes, as increased humidity makes us feel the heat more and increases the feeling of discomfort. Fog is very rare and when it occurs it is very early in the morning.